Those trained to observe peculiarities in anatomy may notice a pattern of sorts emerging when looking at Raphael paintings for an amount of time. As someone with this type of training, whilst working on my Raphael project I began to notice some anatomical variation in the feet of some of his figures. Deciding to investigate it further, I was delighted to find that colleagues working in the health profession had been discussing this for a while. In a British Medical Journal commentary published in 2000, Polydactyly reported by Raphael (Mimouni et al) attracted great interest from medical professionals around the world. This article cited two specific works, La Belle Jardinière at the Louvre and Sposalizio in Milan. Subsequent responses to this article, including by medical personnel working at hospitals in Italy and Spain clarified further examples of polydactyly "with varying degrees of expressivity" in other Raphael paintings. This post will summarise the examples cited, and explore their accuracy and iconographical significance. Polydactyly is described as the condition of having more than five fingers or toes, either on the hand or foot. 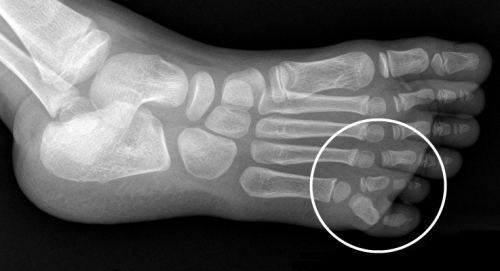 Variations in the bone structure and location describe different types of polydactyly, such as preaxial polydactyly describing the extra digit's location occurring on the side of the thumb or big toe. Conversely, postaxial polydactyly is when there is an extra digit beyond the fifth digit, namely the little finger or toe. There are genetic markers which predispose this condition, with postaxial polydactyly being confirmed as a genetic trait manifested across members of a family. The varying degree of expressivity which comprises different types of postaxial polydactyly ranges from some extra tissue on the side of the foot, to tissues comprising some bone (Type B), and more rarely, an entire extra functioning digit (Type A). In considering examples of depictions of the postaxial polydactyly, a summary of the anatomy of the foot is necessary. The adult foot comprises of 26 bones with an additional 2 sesamoid bones about the big toe. These are arranged in rows, providing a varying degree of movement at each level. Connective tissue layers link the bones and muscles attach to key points to allow movement. 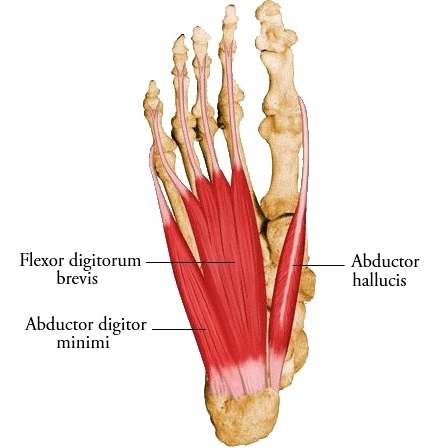 On the outer part of the foot, the muscle which controls the movement of the little toe is called abductor digiti minimi. Surrounding this is fatty tissue, providing some cushioning. Hence, congenital variation in the size of these bones, muscle size and bulk and extent of fatty tissue will account for a great variation in foot shapes. In addition, footwear and environmental factors (functional use of the foot) will also impose forces that can contribute to shape. When looking at the closer details of some of the paintings cited by the medical professionals, the suggestion of polydactyly seems to be varyingly present. I have also contributed some other examples below, including a discussion of factors influencing artists depiction of feet in a variety of shapes. Those looking for iconographical answers to this question have looked at two key sources. One of these is the Old Testament, where the Book of Samuel describes four philistines whom were slain by David and his followers - these four were said to have six fingers and six toes, and be descended from giants. Depending on which version you consult, the four were said to be the offspring of "Rapha", "Arapha" or "Rephaim." It must be noted, some translations leave this name out completely. Raphael used his wonderful skill with the brush to embody it in two of his great paintings, The Sistine Madonna and the Marriage of the Virgin... [In the Sistine Madonna] the Pope is represented as pointing to the Madonna and the Christ Child, and a close examination of the hand wherewith he points will show that it has six fingers. There is not historical evidence to show that the Pontiff actually had such a deformity, neither can that fact be an accident; the six fingers in the painting must therefore have been due to design on the part of the painter. In [the latter] picture Mary and Joseph are represented together with he Christ Child under such conditions that it is evident that they are just on the eve of departure for Egypt, and a Rabbi is in the act of joining them in wedlock. The left foot of Joseph is the foremost object in the picture, and if we count we shall find it represented as having six toes. By the six fingers in the Pope's picture and the six toes of Joseph, Raphael wants to show us that both possessed a sixth sense such as is awakened by Initiation. By this subtle sense the foot of Joseph was guided in its flight to keep secure that sacred things which had been entrusted to his care. To the other was given a sixth sense that he might not be a blind leader of the blind but might have the "seeing eye" required to point out the Way, the Truth, and the Life. And it is a fact, though not commonly known, that with one or two exceptions when political power was strong enough to corrupt the College of Cardinals, all who have sat upon the so-called throne of Peter have had the spiritual sight in a greater or lesser degree. Whilst some argument can be made for Joseph's foot being a candidate for postaxial polydactyly, close examination of the Pope's fingers reveal no suggestion of polydactyly. One can only surmise that both Cantini and Heindel did not have access to sufficiently detailed images when making their observations. Mr. Cantini states the infant in this piece has six toes. Images of this work I presently have access to are not clear enough to make any further comment on this. 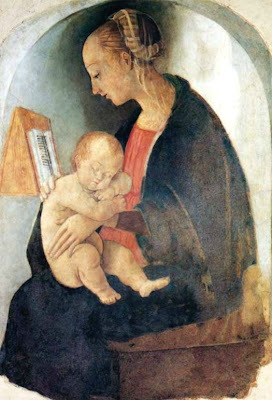 It must also be noted the attribution of this fresco is contested, with some scholars believing it to be the work of another artist, including Raphael's father, Giovanni Santi. nb. This work is generally regarded as a workshop piece, attributed to pupils Penni or Giulio Romano, possibly based on a Raphael design. Only a small number of scholars believe it to be a Raphael autograph work. 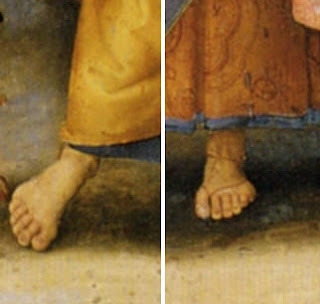 Some comment needs to be made about the variation seen in depiction of feet in works attributed to Raphael and his workshop. In many instances, Raphael depicted both hands and feet with remarkable accuracy and, in some cases idealised grace. In other instances, the foot shapes seen are less idealised. Rather than assigning each variation as a potential case of polydactyly, natural variation in foot shape, and the position the foot is in can account for the depiction seen, particularly when there is a greater prominence on the outside of the foot. To put it simply, neither Raphael's imagination, nor early 16th century Italy was as drastically populated with extra-digited individuals as the enthusiasm of the original BMJ article suggests. The case of the Gavari Altarpiece (aka Mond Crucifixion c.1502-3) at the National Gallery London is particularly fascinating as it allows a comparison of Raphael depicting feet in different poses. The prominence seen of the outside of feet needs to be weighed against whether the foot has been depicted (or modelled) in a weight bearing position. In the Gavari Altarpiece, the figure of Christ and and Saint John have their feet supported by a block on the crucifix and the ground respectively. On the left, the foot of the Virgin bears no weight, yet still shows a similar presentation. 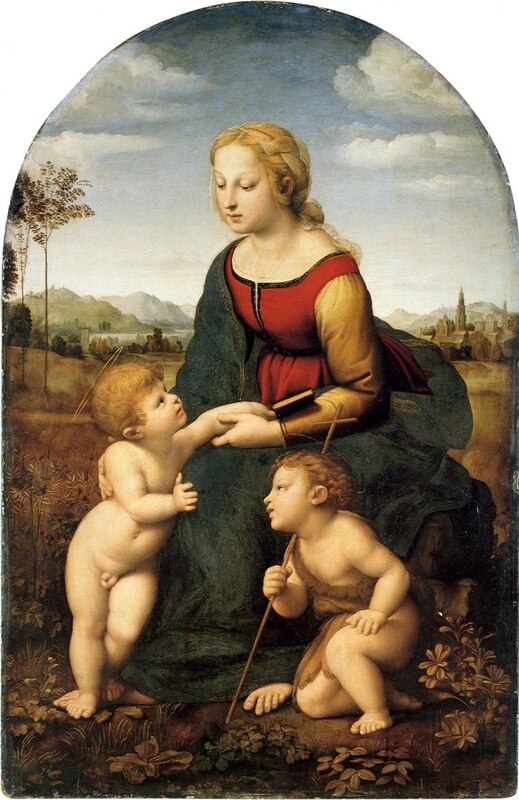 Is this a suggestion of polydactyly, or a discrepancy in technique in this early Raphael piece? Similar protrusion of the outside of the foot can be seen in other paintings to varying degrees. These depictions are more likely to be nuances of how the artists has handled the positioning of the foot than a deliberate attempt at depicting polydactyly. Some observing these depictions may argue that the artist was making functional adjustments based on proportionality. Whilst quite possible, we must also not rule out that these depictions are scattered among a higher proportion of normalised versions - where no such discrepancy is noted. In particular, Raphael's increasing skill as a draftsman would predispose him against such unnatural depictions committed repeatedly by accident, which needed to be adjusted as pentimenti. To test this perhaps, a more thorough survey of available under-surface scans of the above works would be useful. 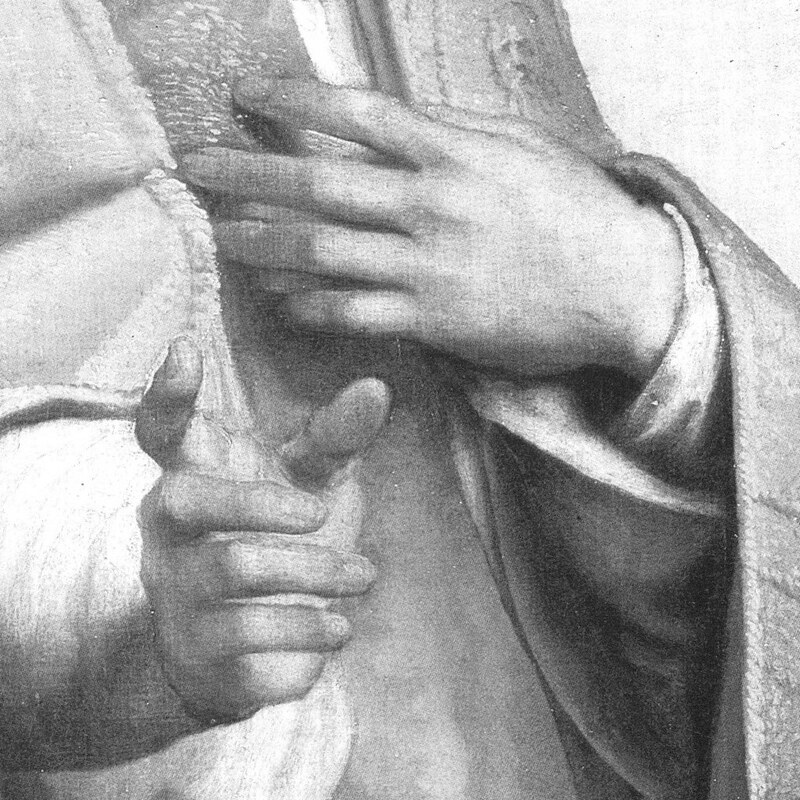 In the case of the Gavari Altarpiece, an infrared photograph of the foot of Saint John betrays no hint of adjustments to original proportions of the foot. In fact it could be argued that had Raphael followed the natural line of the outer border of this left foot, it would have appeared more natural than it presently does, without a need for proportional adjustment for aethetic purposes. This being said, it would be premature to make any firm conclusions without a wider sampling of data. The Oddi Altarpiece: Coronation of the Virgin (c.1503-4) Figure of Christ, left foot, Rightmost angel with fiddle, though the appearance of the latter is more easy to attribute to the turned down (plantarflexed) positioning of the foot. Solly Madonna (c.1501-2) and Virgin and Child with Saints Jerome and Francis (c.1502), both in the Gemaldegalarie Berlin, show the foot of the Christ child on an supporting object - the hand of the Virgin and a pillow respectively. 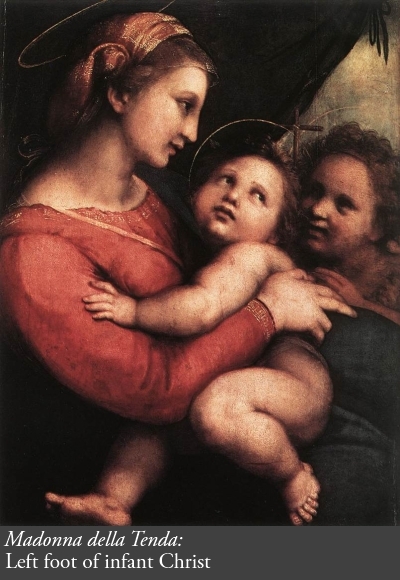 This is also seen in works from later phases in Raphael's career, such as the Madonna della Tenda (c.1513-14, Alte Pinakothek, Munich). As noted in responses to the Mimouni et al piece, the feature seen in the young John the Baptist in La Belle Jardinière is also repeated in the foot of the Virgin, a factor not mentioned by the original authors. Mimouni et al attempt to explain the presence of polydactyly in Raphael's figures by assuming that they are based on models from the same family. 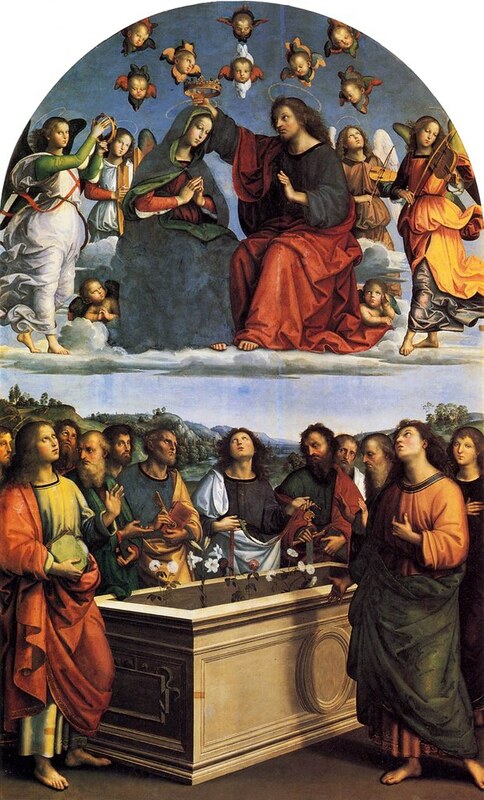 Another vital factor is that these depictions are spread among Raphael's career, from his earlier periods in Umbria and Florence, to his later period in Rome, including his final work, Transfiguration, which was completed by pupil Giulio Romano following Raphael's death in 1520. To assume that Raphael sought and maintained the services of models with polydactyly across such a span of time and distance in the early 16th century is fanciful at best. Raphael was a masterful draftsman, whose propensity for drawing anatomical structures improved with time, particularly after his exposure to the Florentine artists, whom espoused this skill as most favourable in artists. Raphael was hence perfectly capable of adding these anatomical features without a reliance on models. The degree to which Italian artists were familiar with this theme has yet to be thoroughly investigated. Depictions of David and Goliath would also be worth investigating in this instance, as Goliath was of the race of 'giants' the reference from the Book of Samuel refers. 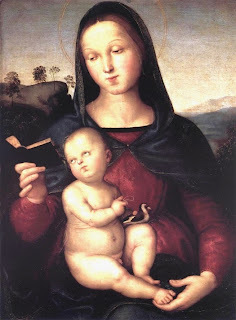 What can be said with a greater degree of certainty is that unlike many of the lessons Raphael learnt in Florence, this idiom of suggesting extra digits on some of his figures goes back to his exposure to Perugino and Timoteo Viti.. 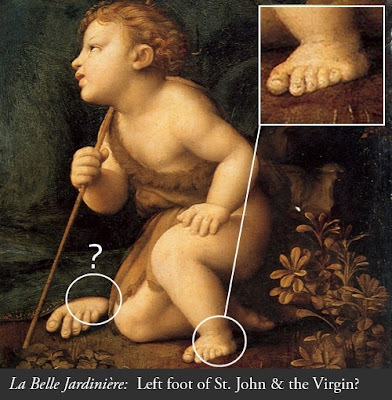 The best evidence we have of this is the similar depiction of feet seen in Perugino's version of Sposalizio - a fact pointed out by Lazzeri and Pantaloni in January 2010, which was the latest response to this ongoing discussion in the medical community. The two Italian plastic surgeons also point out a similar case of polydactyly present in a work by Raphael collaborator Timoteo Viti. The conclusion reached from this accumulating interest is that at present there is no complete account of the extent and variation of these depictions in the art of the 15-16th centuries. Research published in 2011 highlights ongoing interest in similar themes depicted in Renaissance art. 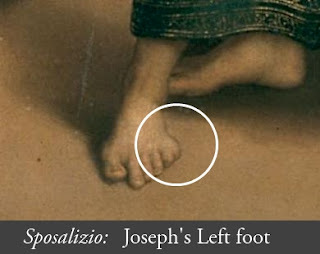 The figures common to this research seem to be Albury and Weisz, with publications looking at (Raphael pupil) Giulio Romano's Holy Family and depictions of foot deformitities related to Saint Joseph. In the case of the latter, the iconographical significance is attributed to Saint Joseph's hardship, indicating the lengthy travel during the flight to Egypt and the subsequent return. As we have seen however, this feature is also suggested in depictions of Saint John and female figures as in Perugino's Sposalizio, and Raphael's Gavari Altarpiece and La Belle Jardinière. This clearly demonstrates this iconographical attribute is not just related to Saint Joseph. As work continues on my Raphael project, if further depictions of polydactyly turn up, I will add them to the list above. If you are aware of any other clear depictions of six fingers or toes in Renaissance art, please feel free to comment below or contact me. Akarsu AN, Ozbas F, Kostakoglu N. Mapping of the second locus of postaxial polydactyly type A (PAP-A2) to chromosome 13q21-q32. Am J Hum Genet 1997; 61: ((suppl.)) A265. Cantini A. 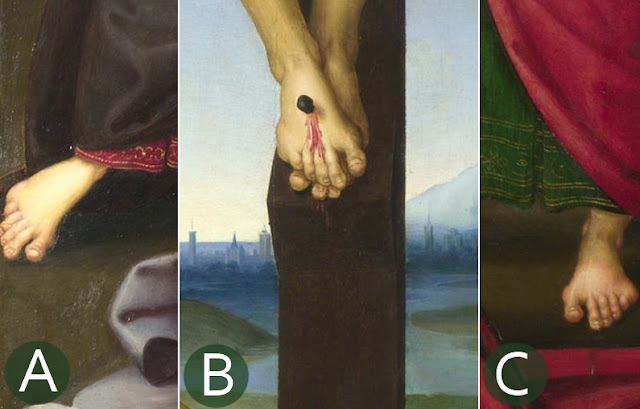 More examples of polydactyly in Raphael’s paintings.Should a systematic survey be warranted? BMJ USA 2001; 1: 234. Fernandez-Menendez. JM. Further cases of polydactyly in Raphael's work. BMJ USA 2001;1: 234. Meyer zur Capellen, Raphael: The Paintings. Arcos Verlag. Vol 1, Vol 3. Shearman, J. Raphael in Early Modern Sources. Yale University Press. 2003. Really brilliant post, the best in a very long time. Thanks a lot! Hi M! There has to be a missing link somewhere that explains the attraction of this physical attribute to artists of that era. Maybe it is congruous to some of Heindel's statements, though ideally I would like to locate a 16th century or earlier source. The link with the race of giants seems less tangible, maybe there is something hidden in The Golden Legend of Christian Apocrypha that help explain it? I have found some more recent articles that look at similar phenomena which I will incorporate into the post and references. 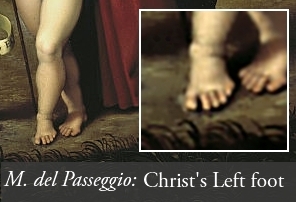 I see strange looking toes in renaissance, and baroque art all the time. I've always put it down to the eccentricity of the artist, or their manner of drawing. For example, Lorenzo di Credi frequently has the big toe of Jesus turned up. I thought he was doing this as a way of distinguishing himself from other pupils in Verocchio's workshop. I admit that there might be an iconographic explanation for the phenomenon. I wonder if there is any rhyme or reason in the use of the 6 digits. Is it just a characteristic of sacred figures? Is it always the forward foot? I thought it might be just the left foot but then you had some right foot examples. Maybe Heindel was on to something. Thanks for a very well balanced presentation. Cheers for the feedback Frank. I too am thinking there must be some source for this other than artist's whim, or the old testament text. Soething in the apocrypha or Golden Legend perhaps - if I locate anything specific, I'll update the post. Perhaps the effect is influenced by a proportional dynamic. If the proportion is not satisfactory to the body, other figures, or even the other foot, adjustment will be necessary. 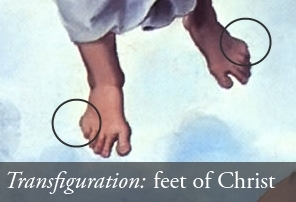 For example: If the polydactyl effect in the Viti painting above is covered, St Johns right foot will appear very small, particularly in direct proportion to the left. Enlarging the big toe would appear silly, and would then require the big toe on the other foot to need readjustment. I would suggest that most painters of the figure progress from the big toe. The outside of the foot is the most plastically flexible to alter for proportionate visual effect. The extra flesh imparts a sense of proportion and a fleshy gravity without reworking the whole foot again. (di Credi not included)This may account for a % of the effect. Besides, feet are always so annoying to do; just look at Da Vinci’s 1499 cartoon of the Madonna and Child with St Anne and infant St John… A fun post! Thank you. Cheers Paul - thank you for your input, and welcome to 3PP! Proportional adjustments could indeed be an influence in some of these depictions. Though it becomes harder to put it down to this across *all* of them, spread across Raphael's entire career, not to mention other workshop artists implementing works of his design under his name. We could possibly test this by looking at undersurface scans and pentimenti - I've edited the post above to reflect this (in the section on the Gavari Altarpiece). Having learnt to depict feet using this "splayed" shape as a pupil, Raphael continued to do so without much reflection or revision for rest of his career (including instances where it is rather inappropriate, such as floating figures!) Raphael's interest in anatomy was always far less serious and more superficial than that of his great contemporaries Michelangelo and Leonardo, and I think this accounts for his reliance on what could be termed a "stock" foot shape learned as an apprentice. Rather than going down the medical/physiological route, I think a much more fruitful approach to looking at anatomy in Raphael's art (and art generally) is to understand that artists "learn" to see the human body; they have to CONCEPTUALISE the forms of the body before they can depict them, and this process has remarkably little to do with sitting in front of a model and transcribing what they "see", and much more to do with looking at the work of other artists -seeing how they have conceptualised forms and "solved the same problems" previously. 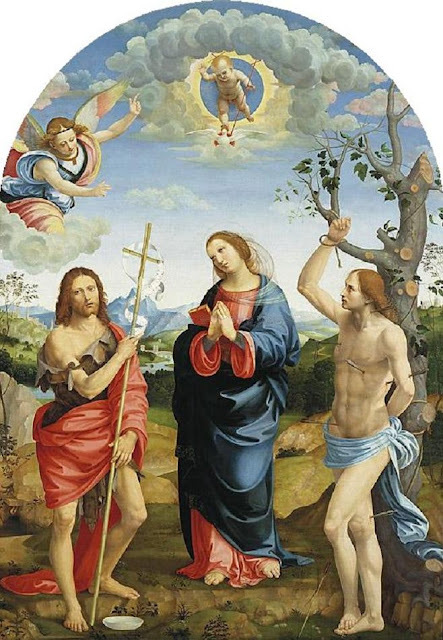 Because of this, almost random peculiarities/idiosyncrasies of taste and aesthetic judgement can sometimes become very influential and persistent as they are passed down with minimal alteration from master to pupil(and as you show, Raphael's conceptualisation of the form of the foot is all but indistinguishable from Perugino's). I think the "splayed" foot shape we see in Perugino and Raphael's art is a good candidate for a 15th/16th century anotomical art "meme"! By way of a footnote (no pun intended!) 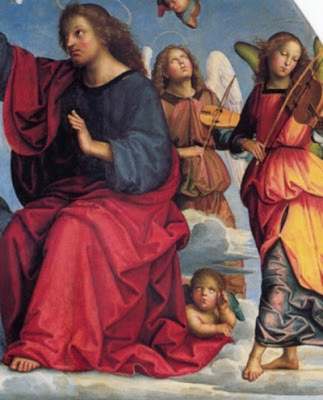 if the feet in Raphael's pictures really are polydactyl in order to convey some religious/mystical significance, then why portray them so ambiguously and doubtfully? - why not clearly and explicitly show six toes to make the point? A quick follow-up to my previous comment: I think an interesting new perspective can be gained on the Perugino/Raphael foot type by looking at an artist from a totally different era who also favoured an exaggerated "fleshy bulge" on the outer edge of the foot:- Rodin. Many of his works have feet with somewhat pronounced bulges on the outer edge behind the little toe. Particularly good examples are the left foot of his St John which has a very prominent, toe-resembling bulge on it; also the feet (particularly the left one) of his famous "Thinker", which have very massive, almost swollen-looking outer edges. I think this is a clear case of individual aesthetic preference concerning "normal" feet, rather than an objective representation of feet with polydactylism; and this is also what I would argue in relation to Raphael.